The new app is available in a free version with some simple features for viewing 2D and 3D .DWG files and making basic annotations. With a subscription, the full version of CorelCAD Mobile unlocks its full set of editing features with 2D drawing tools, advanced annotation capabilities and support for 3D model viewing. The subscription version costs $99.99 US (99.99 euros, 89.99 GBP) annually or $9.99 US (9.99 euros, 8.99 GBP) per month. It includes Sketch tools for capturing ideas remotely, using tools the company says CorelCAD desktop users will find familiar. Subscription users can also make model changes or fixes with more than 150 drawing and editing features. Corel states that the app's 2D tools for drawing and editing are both "optimized for touch and high precision." Users can move .DWG files between Corel's desktop and mobile platforms using Box, Dropbox or Google Drive to either store drawings in the cloud or copy them locally to their mobile device. From either their iPad or iPhone, users can present to clients and colleagues with projector video output support, enabling teams to perform collaborative, remote editing of .DWG models. Drawings can also be annotated to add or edit project details such as measurements or to include text notes. Additionally, PictureNote and VoiceNote features allow mobile users to capture an image or record their voice, then pin the image or recording to a specific place in a drawing. 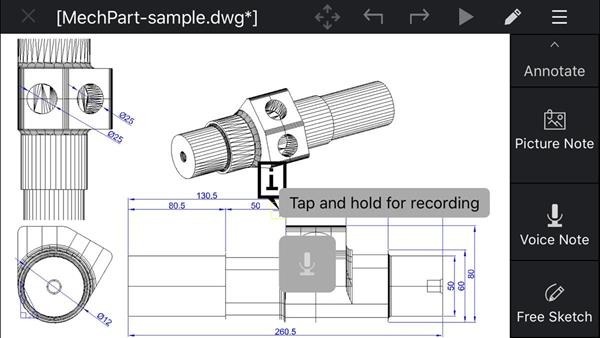 CorelCAD desktop Mac or PC users can view the images or listen to voice notes to address the necessary modifications in the .DWG file. CorelCAD Mobile appears to have been previously made available for Android devices. Corel hasn't launched an iOS app since 2010 when it released a consumer-focused, free drawing app for iPhone named Corel Paint it! Now. That title hasn't been updated in seven years. In contrast, Corel competitor Autocad has long embraced Apple's iOS for iPhone and iPad as well as Macs in the professional drawing and 3D modeling space since 2010. 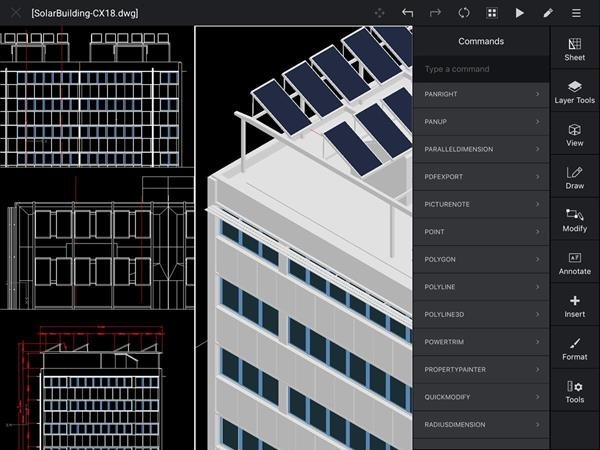 It offers both pro-oriented mobile and desktop apps including its flagship AutoCAD and its consumer-friendly SketchBook drawing app and SketchBook Motion for animating scenes.